Zero crossing detector: do I really need the 7W resistor? CTR > 10% Max diode current: 60ma. I choose 30 ma working diode current. This yields 30ma * 230V = 6,9W for R1. Quite the heater. Also, voltage rating above 400V is required. I realize that a transformer could be used to step down the mains voltage. However, those guys tend to be bulky and rather expensive. Any recomendations? I found some nice explanations onHardware deign and noise suppression on the site. stevenvh's answer looks especially promising on calculating the resistor value. So let's keep my question more general. What are the approaches - resistor, transformer, others. What characteristics are desired in the optocoupler? Is the chosen driving current (30mA) huge and unnecessary? Consider replacing the optocoupler chosen, with one that is designed for direct interface to a mains power line. For example, Fairchild Semiconductors MID400 is one such part. Use a much lower LED current. While your opto may specify a fairly large (20mA to 100 mA, even 1 A in some cases) drive current for the LED, many will work fine at as little as 1 to 2 mA: The part's transfer curve should provide enough information to confirm this. 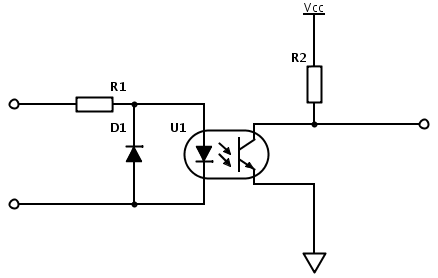 A capacitor can be used as an impedance element for dropping the input AC voltage, instead of the resistor. As the voltage drop is almost entirely pure reactive, there is hardly any thermal dissipation to be concerned about. You do however require "X" rating capacitors, designed for use in AC mains circuits. I'm personally planning to make a zero crossing detector using an old power adapter, one with a conventional transformer. This ensures absolute safety to the circuit. I plan to feed the low voltage output through couple of resistors and clipping diodes to a microcontroller and won't need a optocoupler. For my application however the exact zero crossing isn't too critical as long as relative timing is stable. When using a transformer Wouter's comment about the phase shift will probably apply too. Notice that the circuit diagram below is not for supplying Vcc to the microcontroller. Vcc as marked in the diagram is the power supply already present for powering the rest of the circuit. It is here only used to clamp to. Not the answer you're looking for? Browse other questions tagged zero-crossing or ask your own question. How do I select the accompanying components for an optocoupler? detecting zero cross in ac? Why is zero crossing detector is used in some AC control circuits?